James Bond is on a manhunt from Harlem to the Caribbean to find and defeat the evil Dr. Kananga before he can flood the world with massive shipments of heroin. London, UK; Fictional country of San Monique (Jamaica); New Orleans, Orleans Parish, Louisiana, USA; New York City, New York, USA; Slidell, Louisiana, USA. Three British men get killed within as many minutes - a delegate at the United Nations, an agent in San Monique, and a man succumbs to a snakebite in a voodoo ceremony. 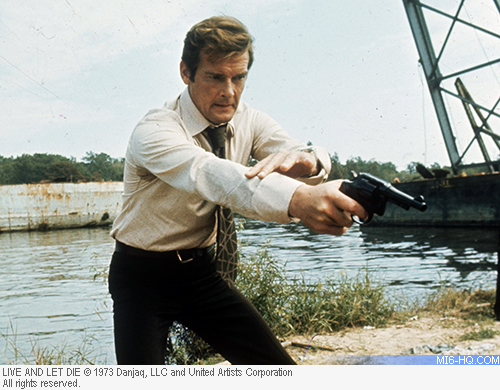 James Bond is absent, but the killings set up the initial plot line. Seeing a voodoo sign (a tatty hat with a feather in it) on their bed, Bond's female companion screams. Bond responds: "Why it's just a hat darling, belonging to a smallheaded man of limited means who lost a fight with a chicken." On the back of Solitaire's cards is a red-and-white design featuring the number 007 repeated over and over. First appearance by Roger Moore as Bond, and the first time Bond drives a bus. 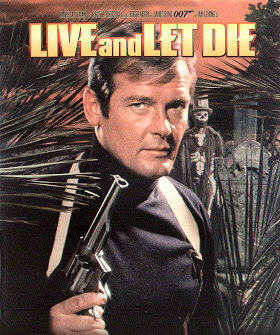 The pre-titles sequence was originally going to feature Bond throwing a man off the top of a skyscraper (accidentally); Bond strangling a goon on the banks of the river chase; Quarrel demonstrates the gas pellet gun; a dialogue reference to Quarrel's father; a scene where Kananga threatens Tee Hee after harms Solitaire. "James Bond Will Return In... The Man With The Golden Gun"